We rafted with another C34 at Block Island and my son mentioned the next day that our boat looked smaller. I assured him we all had the same boat. 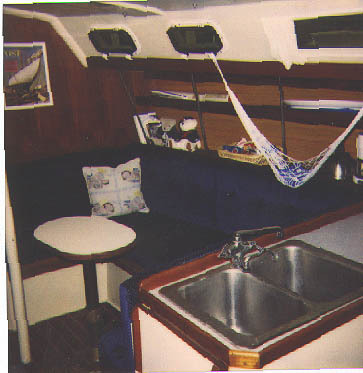 Well I started thinking (very dangerous when I do that) the only boat difference was he stored his main table aft and had an octagon coffee table in its place. This made it easier to get to all the storage behind the table. We had also seen another C34 with their table cut and hinged on one side for more room. Both nice ideas along with all those in the MainSheet but I hated to cut the table and the octagon shape was not our style so I continued thinking. When we got home I took a scrape piece 16 x 25 inch of 1 1/2 inch laminated pine board (doesn't everyone have this in their garage! I do) Now the trick, not round, not 5-6 or 8 sided, hey!!! The top of the house toilet looks about right! Apart came the toilet cover (Michele didn't know that part) and I traced the shape on both ends of the board (went 3/4 inch larger all around to fill the board). I cut the shape out (returned the seat to the toilet). 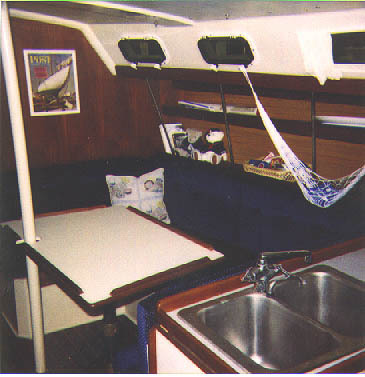 When we returned to the boat and I removed the large table, stood it on end and put it good side to the wall just inside the aft cabin. Well who wants that ugly underside bracket and plywood showing in the aft. The idea light bulb lit again. I took the bracket off.....follow me here....turned the table good side out and ran a bungy cord around it to hold it in rough seas. 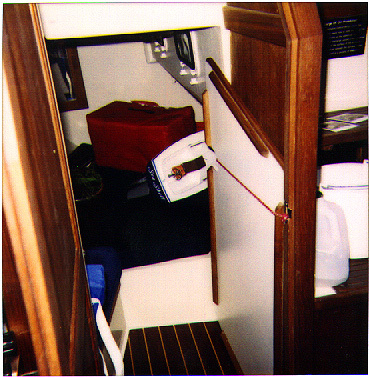 Looks so nice, Michele went into the aft looking for it and did not notice it, the bungy is now another towel rack. OK, now I took the bracket and mounted it to my oval table....put it back on the post,....got funny and added two full place settings and called Michele down for the big test. Boat Looks Bigger!. Much easier to get around to all the hidden storage. The only thing that I now have to do is figure a way to lay the larger table over the smaller and hold it in place. Possibly, two small type clamps attached to the large table bottom side. I would like to put fiddles at four points around the table but it would hinder the larger table being put back on top for the four person dinner setting. Now the question is how long can I get away with the temporary pine table??? I did put white formica on the top!